The first city on the planet to greet the Sun, Gisborne and the surrounding region is home to an extensive coastline, dense forests, and some of the best white wines in the world. At the north-west tip of the North Island, Gisborne -6 hours’ drive from Auckland or Wellington- may seem a bit isolated from the rest of the country. Yet, the region’s diversity and vitality more than make up for its remote location. 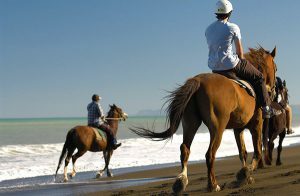 Surf beaches (that have seen many world champions ride their first wave), mountainous forest parks, a rich food culture and great little vineyards are only a few of the many appeals that Gisborne has. 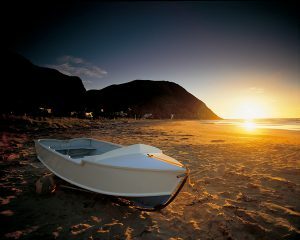 Kaiti Beach, one of New Zealand’s most historic spots, is the landing site of the Horouta waka (Māori watercraft or canoe), around the 13th century. It brought ancestors of the first Māori to the region. Incidentally, it is also the site of Captain Cook’s first landing on 9 October 1769. As a result, Gisborne has an important historical heritage and old traditions are still strong. 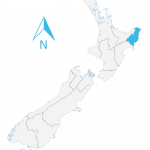 With only 35,000 inhabitants, Gisborne is by no means a large urban area. Yet, it is big enough to be interesting on its own, or as the region’s commercial and cultural hub. The beautiful and overall swim-safe coastline hides a rugged and densely-forested bush with amazing camping spots, particularly around beautiful Lake Wakaremoana. Gisborne has a most pleasant climate all year round, dry and sunny, with mild summers and winters (respectively 24C+ and around 14C in winter). This has appeal many locals but also overseas migrants to make the move. The largest migrant community is from the UK and Ireland. As the unofficial ‘Chardonnay Capital of New Zealand’, Gisborne and its region boast dozens of vineyards with some of the best wines in the country. The area is overall relatively peaceful and its modest but growing cafe scene does not yet rival Auckland, Wellington, or Hamilton’s. Yet, several festivals are held in the region and have seen growing interest over the last few years, particularly Rhythm & Vines, a three day New Year’s music event featuring local and international bands performing in the vineyard setting of Waiohika Estate. The city’s rural charm make it a popular holiday spot. With 1% of the country’s population and employment, Gisborne is a small economy, and very much export-focused jobs opportunities. The region’s climate and high sunshine hours means that the economy relies a lot on winemaking -with popular white and red varietals alike- while agriculture, horticulture (citrus), or forestry are also important. Last but not least, Gisborne’s harbour is home to small fishing boats and sees bigger ships load logs for export.